Get posBoss and Verifone terminals talking. How do I set up eftpos? Let's get posBoss and Verifone talking! Please Note: We highly recommend having a dedicated network and a router with a strong signal, solely for posBoss and Verifone devices. Other devices (from phones to streaming cameras) joining your network can cause communication issues. The Verifone terminal is configured for integration with a till system*. The Verifone terminal is set up with a Static IP address. You know how to find the IP address of the terminal - as you will need this address to connect posBoss to the terminal. If they are unsure, Here's all the Technical Jargon you need to send through to your eftpos terminal provider to make sure they have done the following: They need to set the terminal up for an IP interface listening on port 20001. Do this by creating a record on the TMS (terminal management system) which is called Vericentre. They then download this into the terminal which completes the terminal piece. Settings > posBoss Settings > Control. You will see the following. Click inside the button where it says None. and finally, click Save. You will see some links below to help you get set up. In the posBoss iPad till app go to: Settings > Press Sync Menu. After syncing is finished, fully close and restart the posBoss iPad till app (press the iPad’s home button twice, and swipe up on posBoss to close). 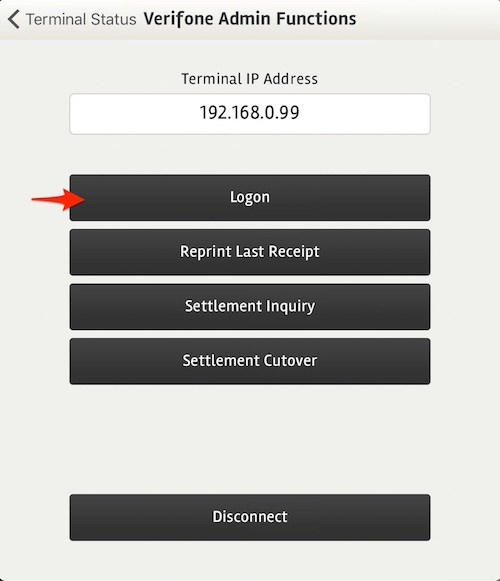 Locate the IP address from your Eftpos terminal and enter that IP address into the field at the top called Verifone Terminal IP Address, replacing any default text. 5. Press the Continue button and if all is set up correctly, you will receive a success message. As a final test, press the settings button at the top right of the window to access the Verifone Admin Functions. Press Logon. The terminal will run it's tests and should then print out a success message. The Verifone Admin Functions page also displays the terminal's IP address you have entered. Here, you can also print your last receipt, and perform settlement enquiries and cutovers. At the bottom of the page is the Disconnect button. Press this to go back to processing card payments without talking to the Verifone terminal.